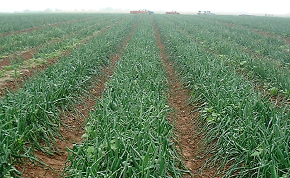 John Rietveld Farms draws from the knowledge of several generations of experience in providing products for commercial onion growers, as well as to wholesalers to the lawn and garden industry. Our central location in the U.S. is ideal for distribution to all areas of the country, and the moderated climate of Lake Michigan is ideal for onion set production. Learn more about our Short, Medium, and Long Day onion bulb programs. Greatly reduce planting time and costs with our bulb planting methods. John Rietveld Farms is a wholesale only distributor, and partner to commercial bulb farming. We DO NOT sell our vegetable products directly to the public. © 2017 JOHN RIETVELD FARMS, LLC.